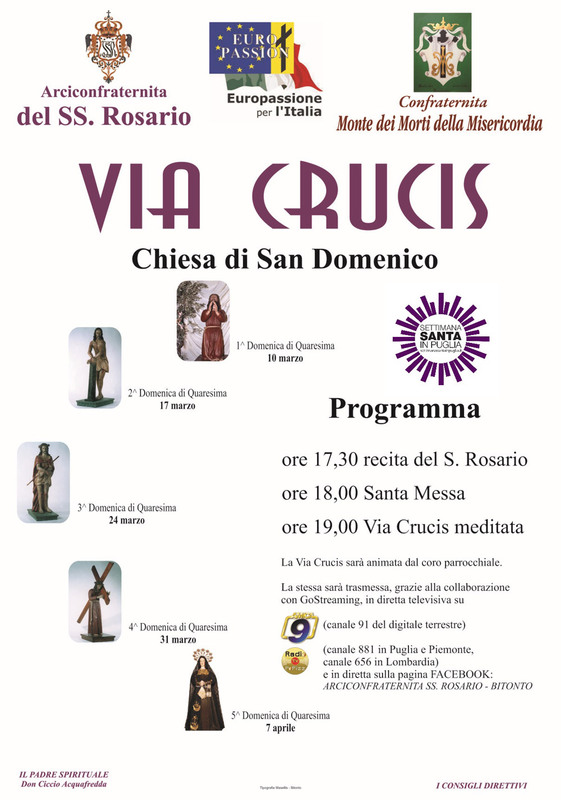 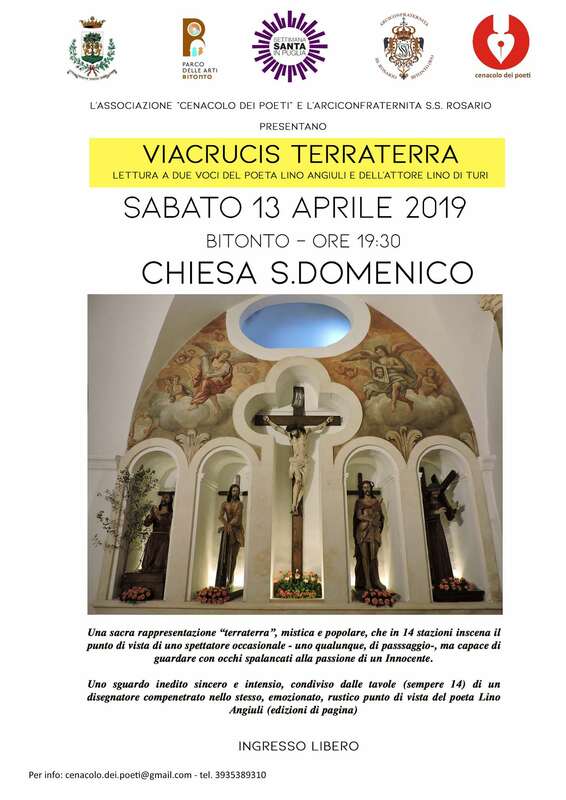 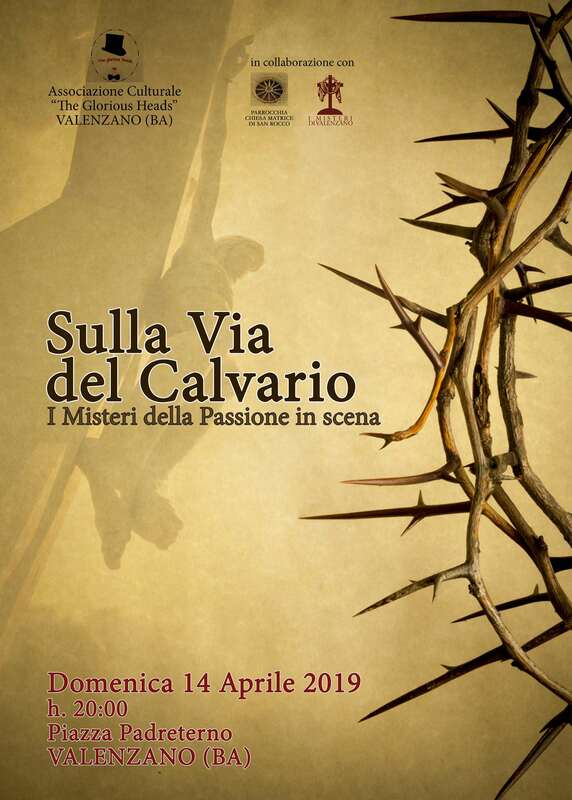 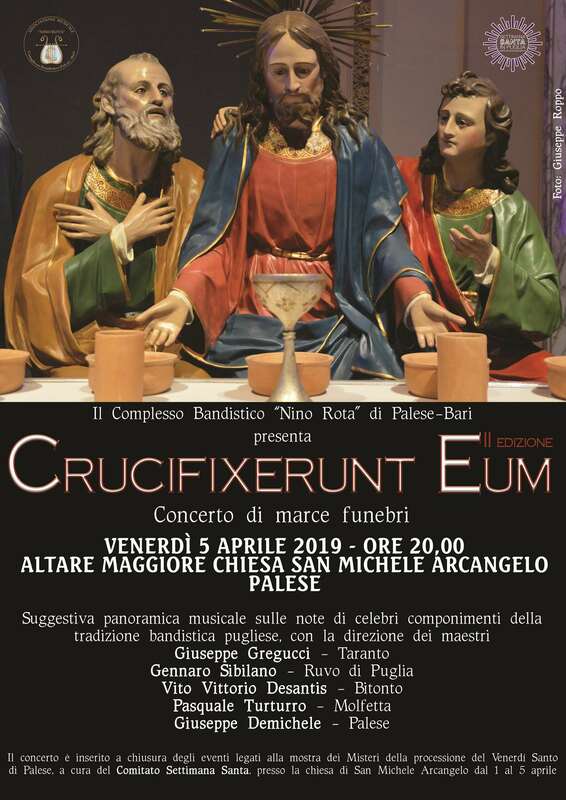 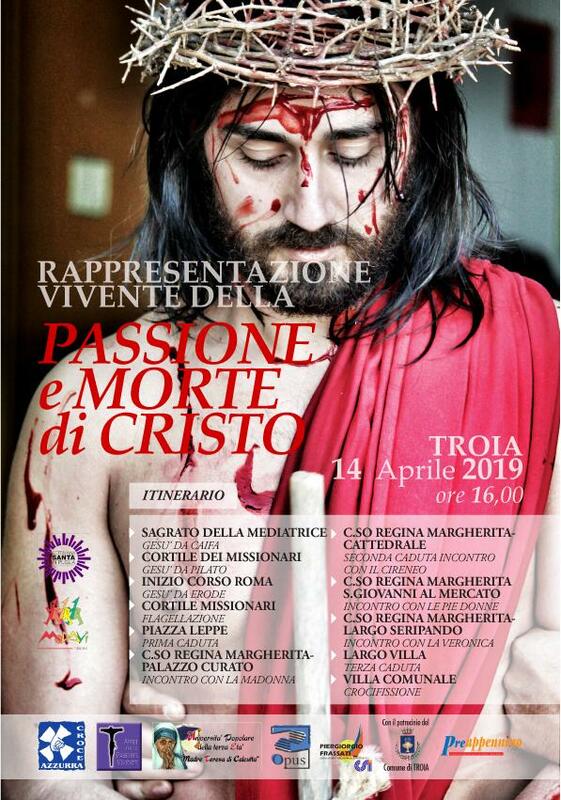 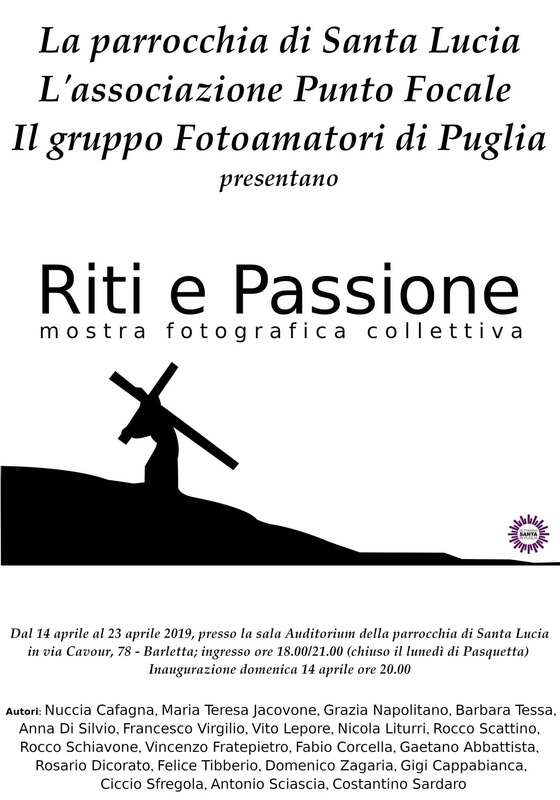 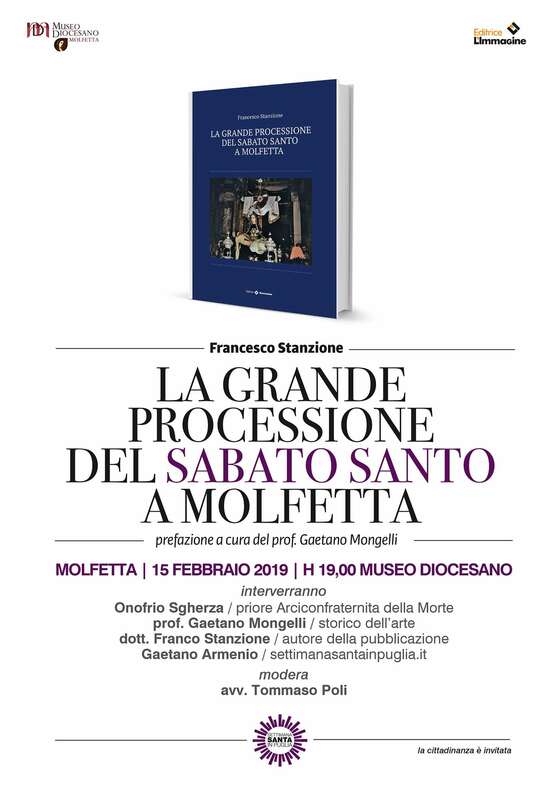 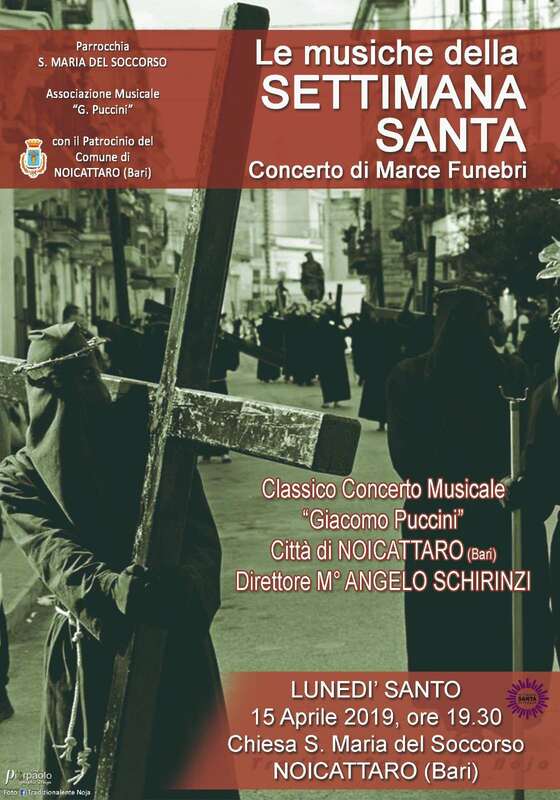 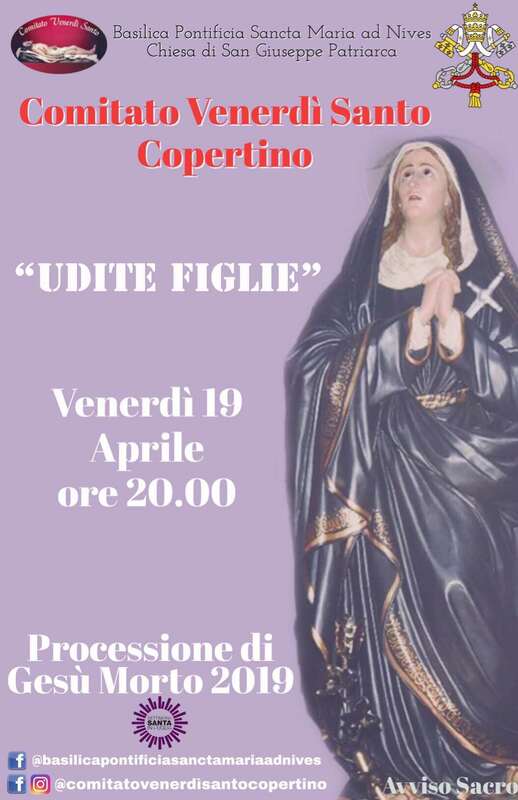 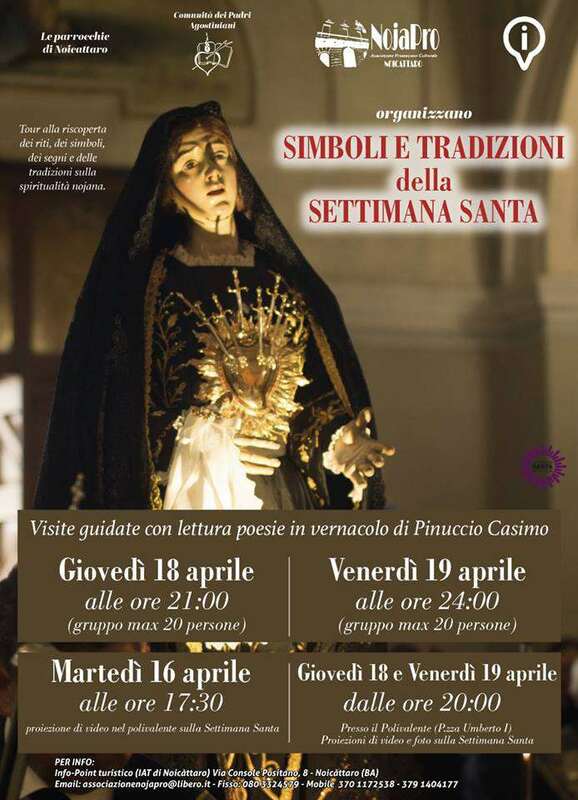 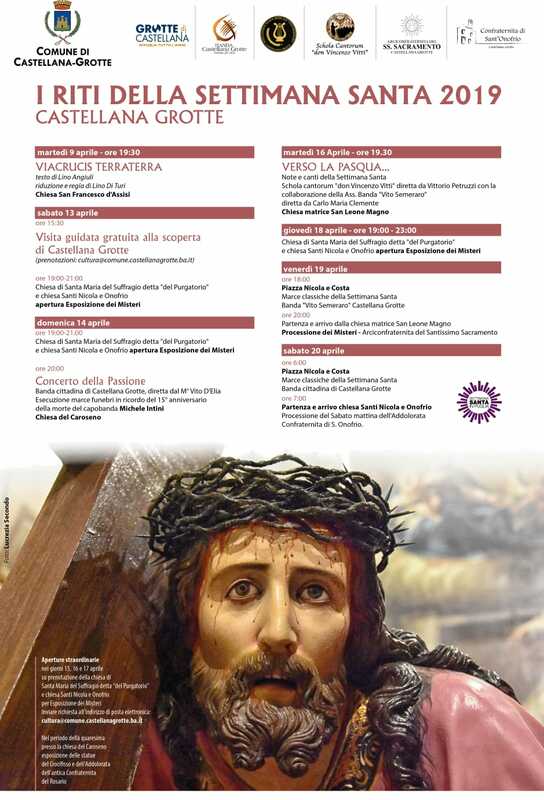 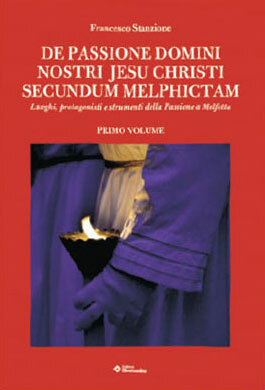 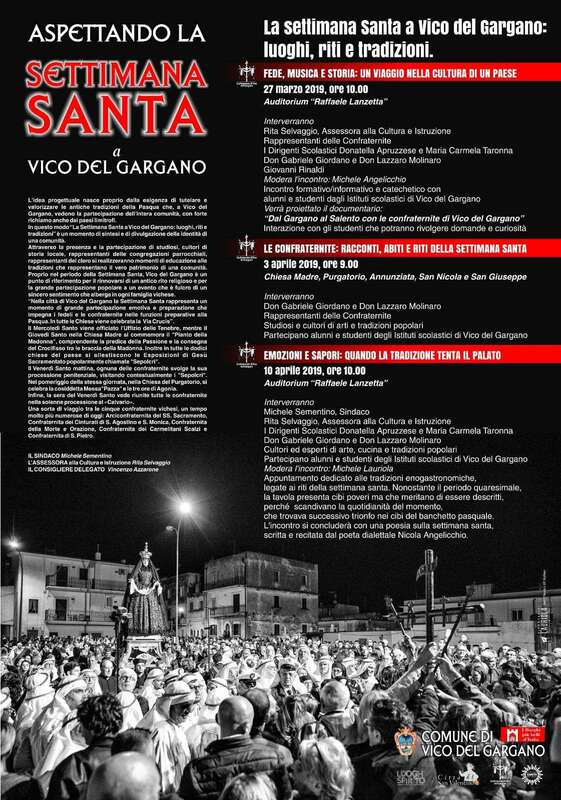 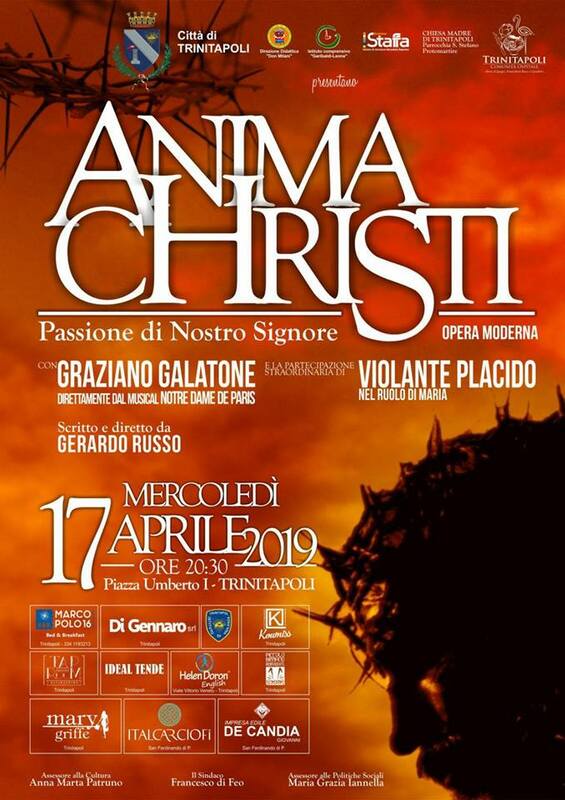 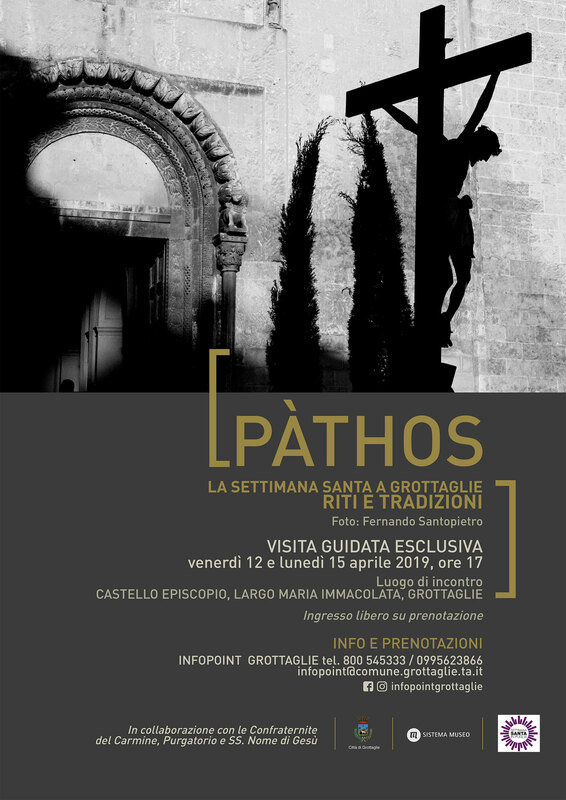 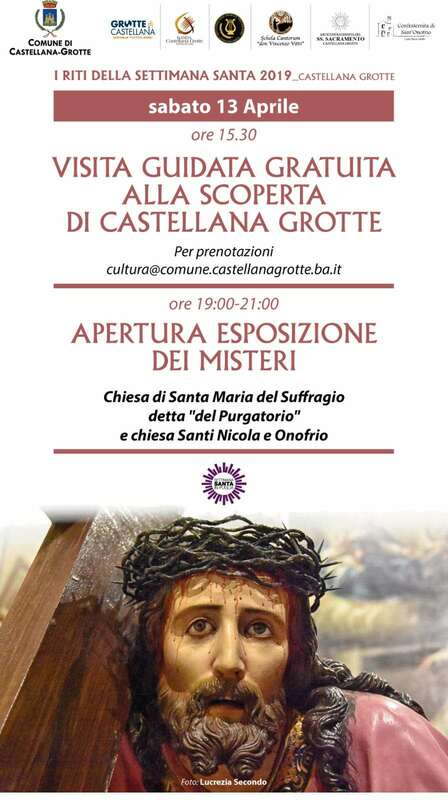 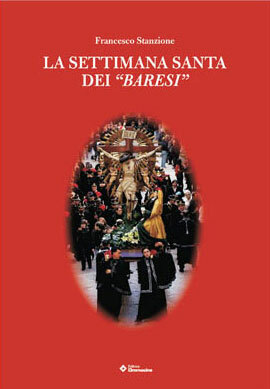 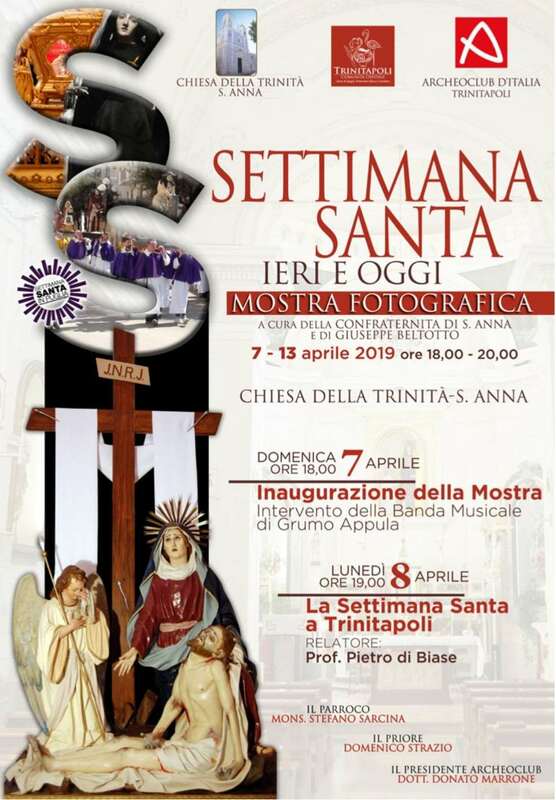 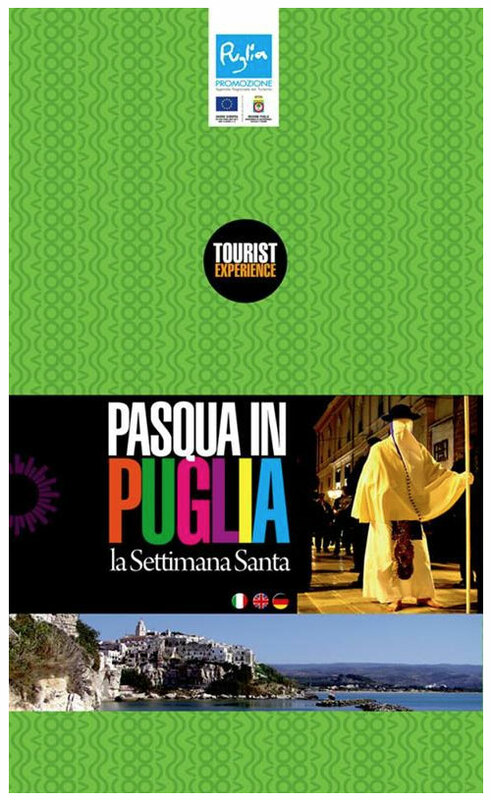 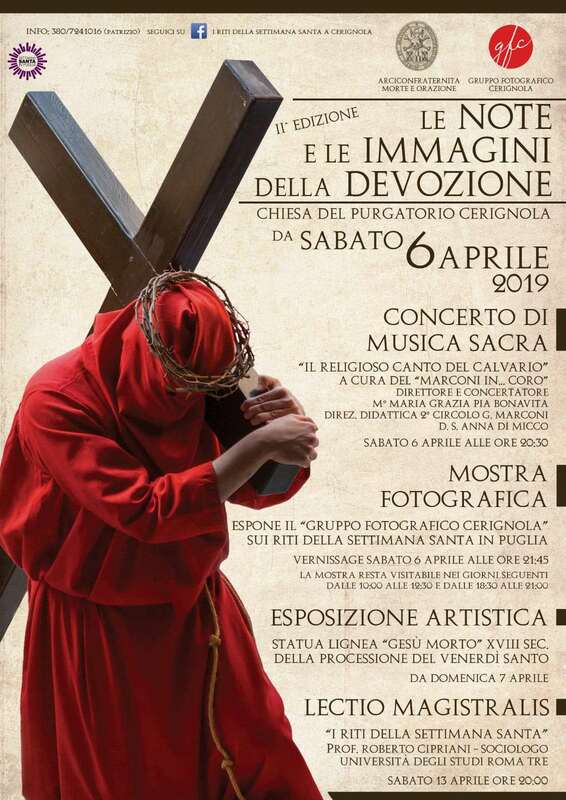 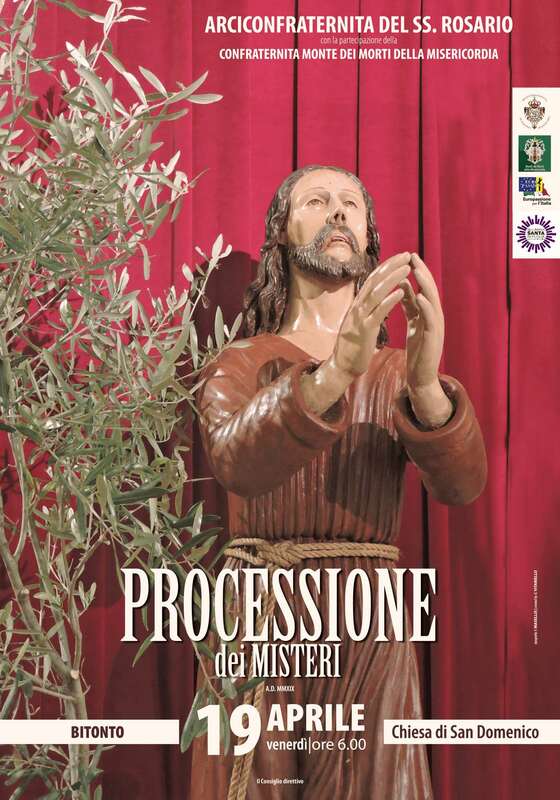 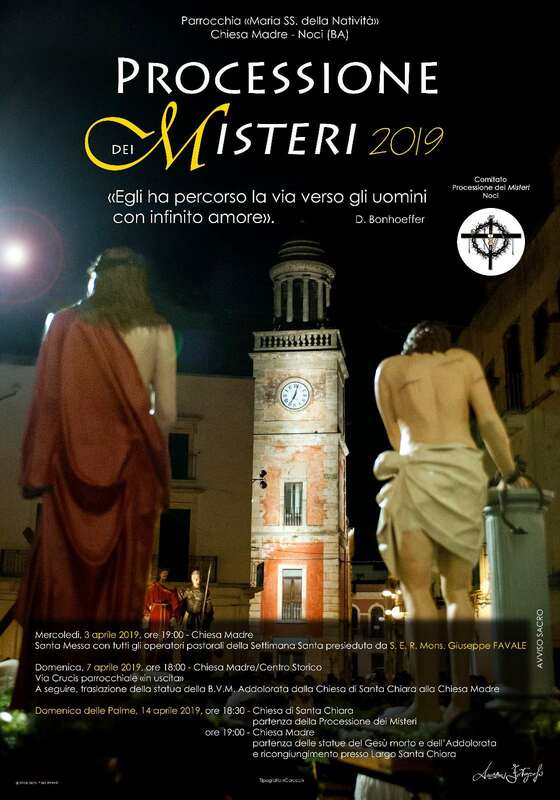 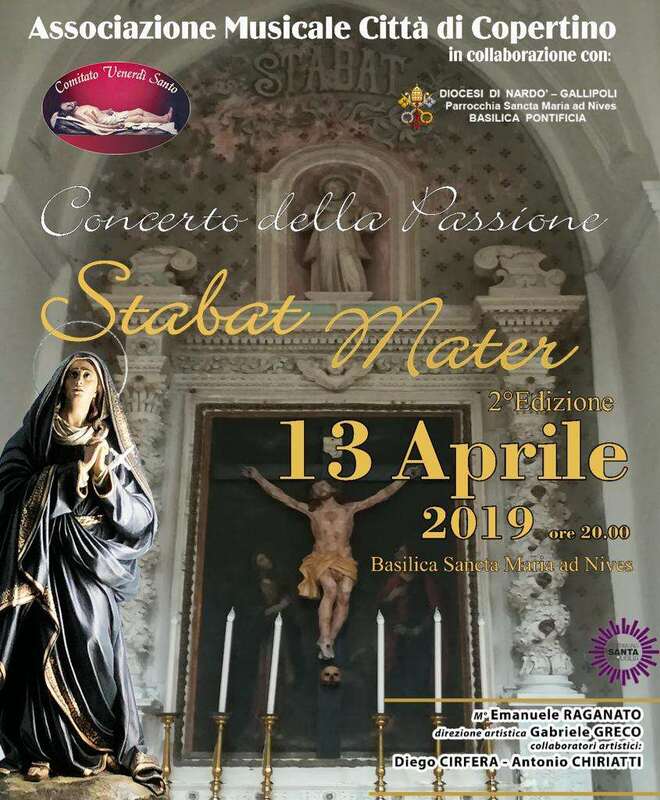 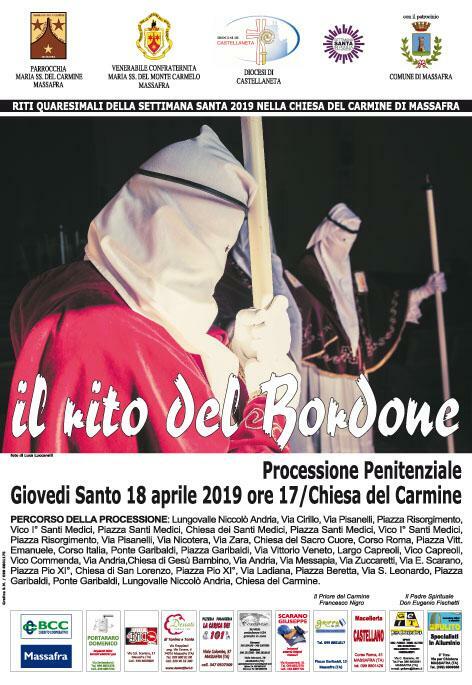 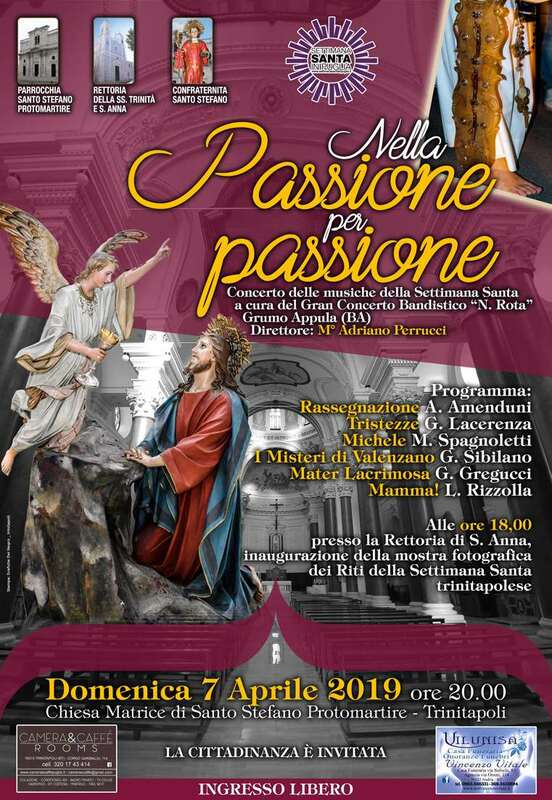 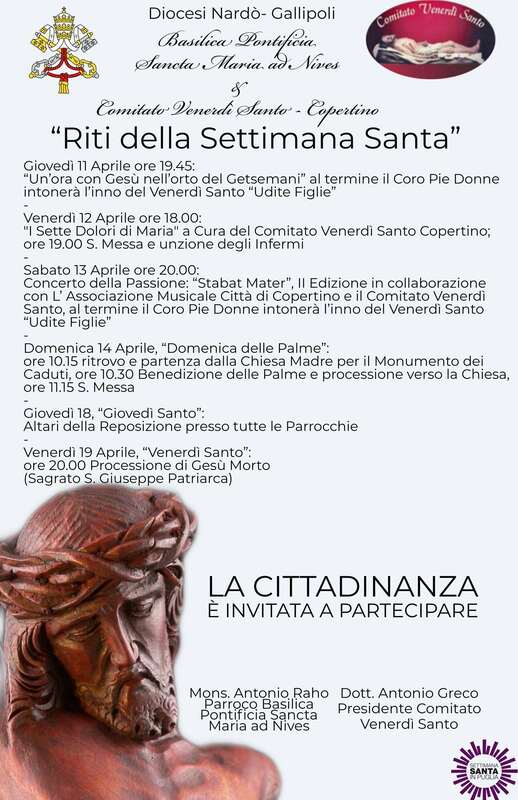 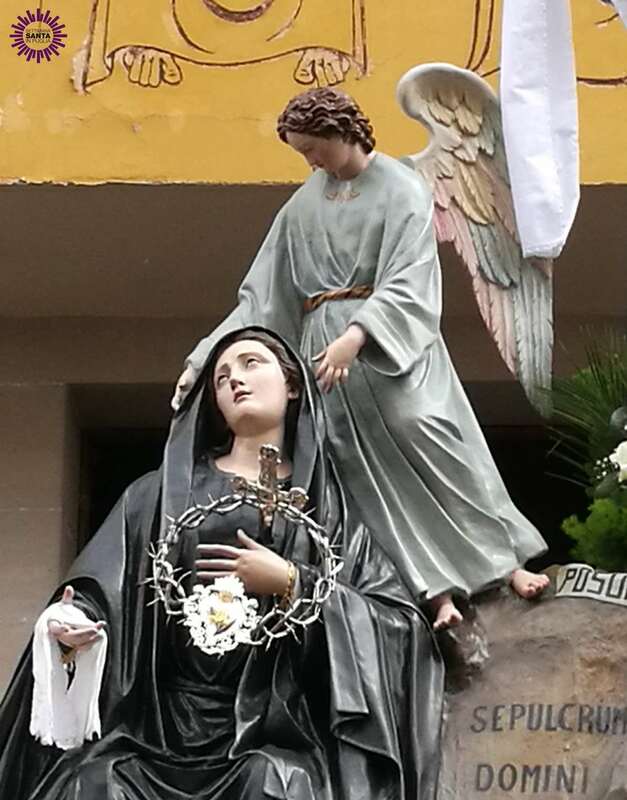 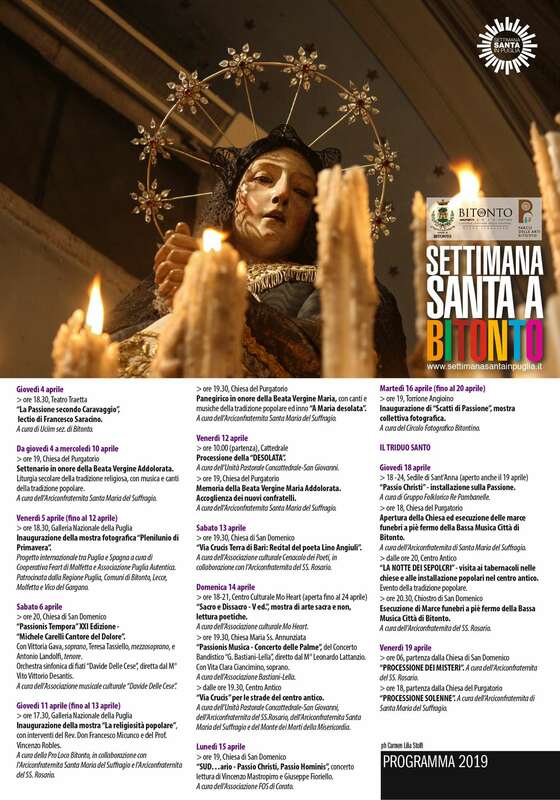 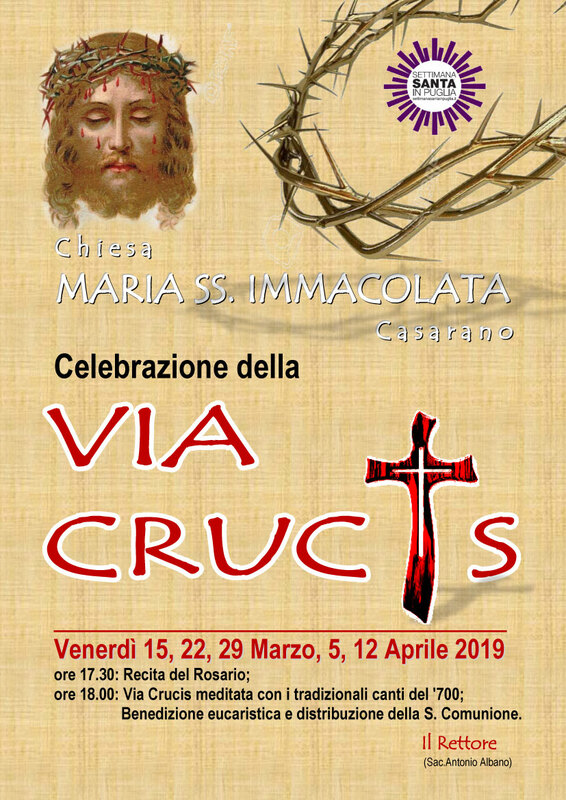 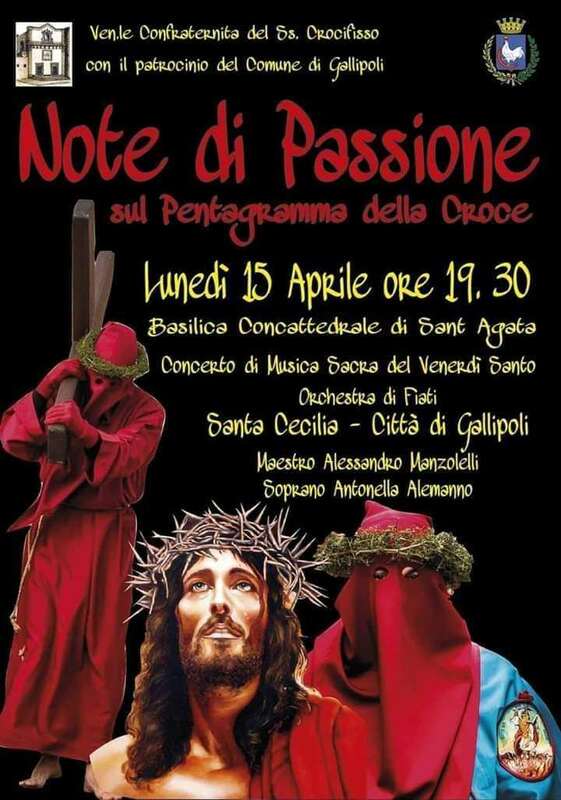 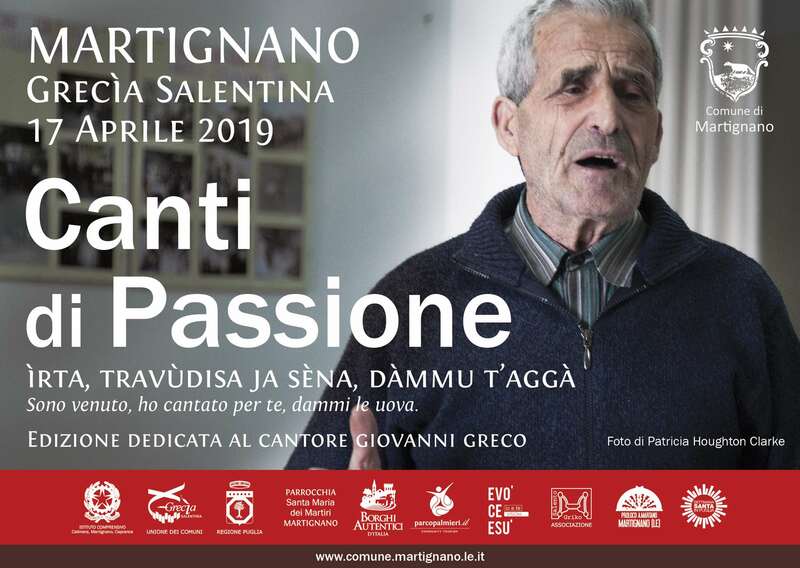 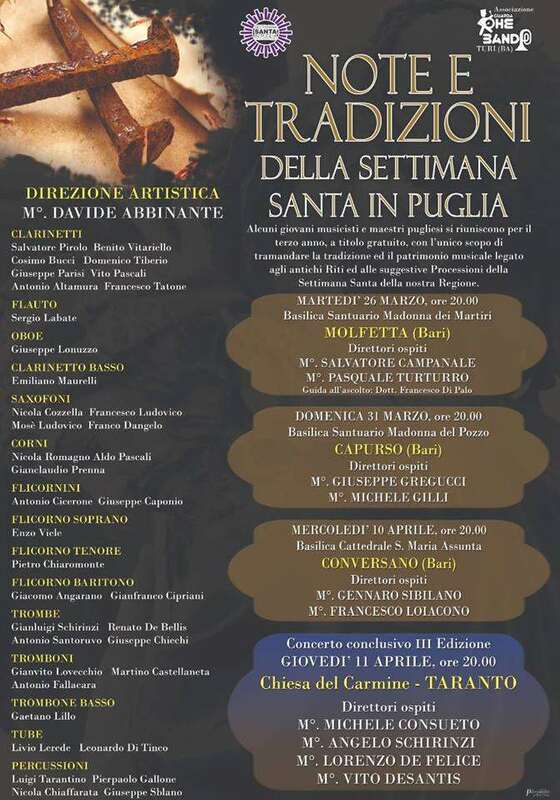 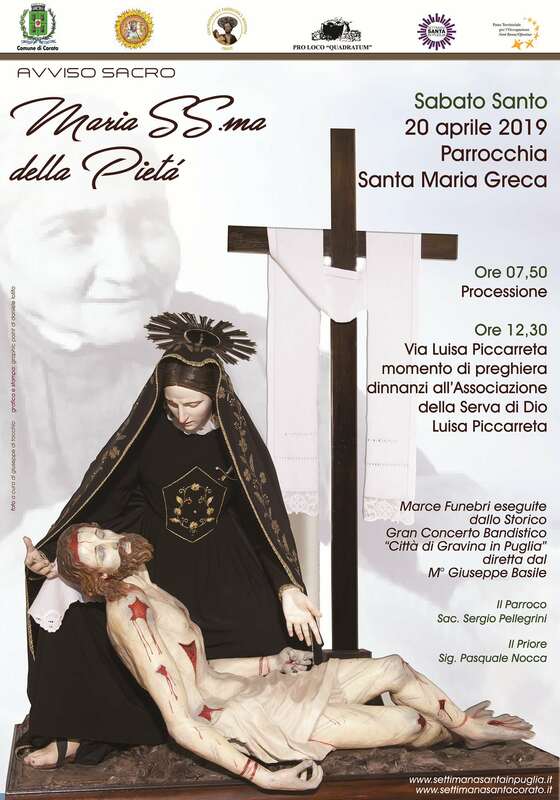 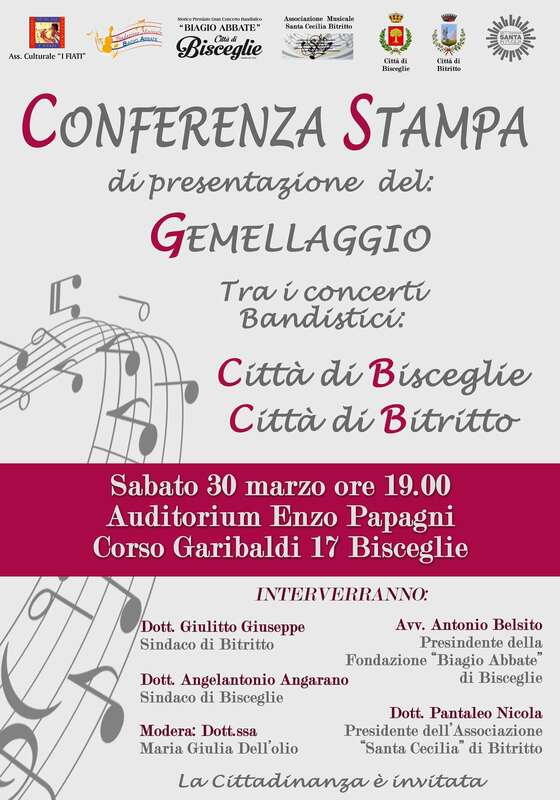 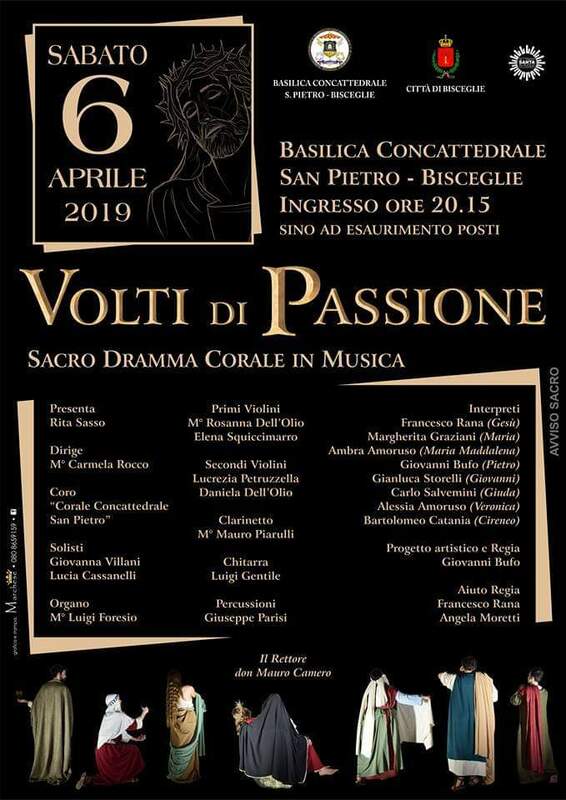 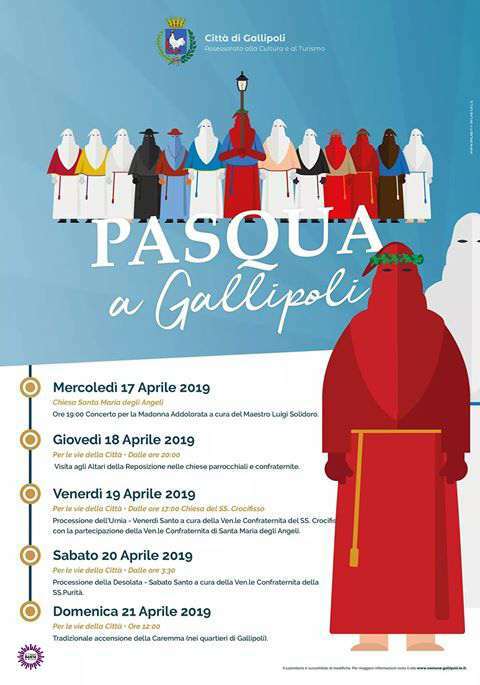 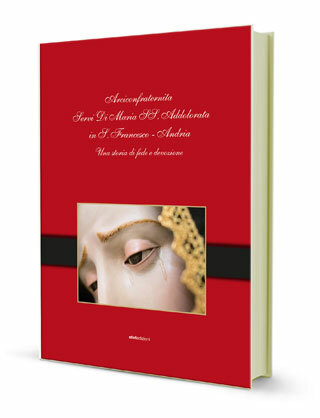 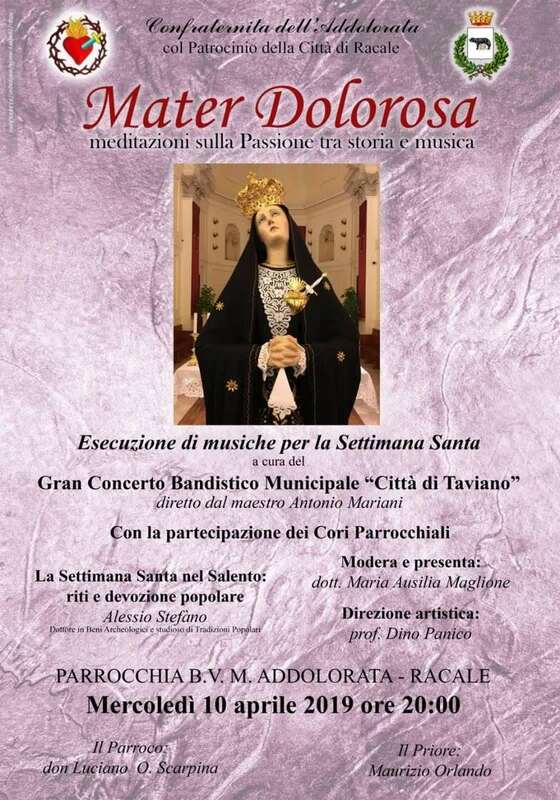 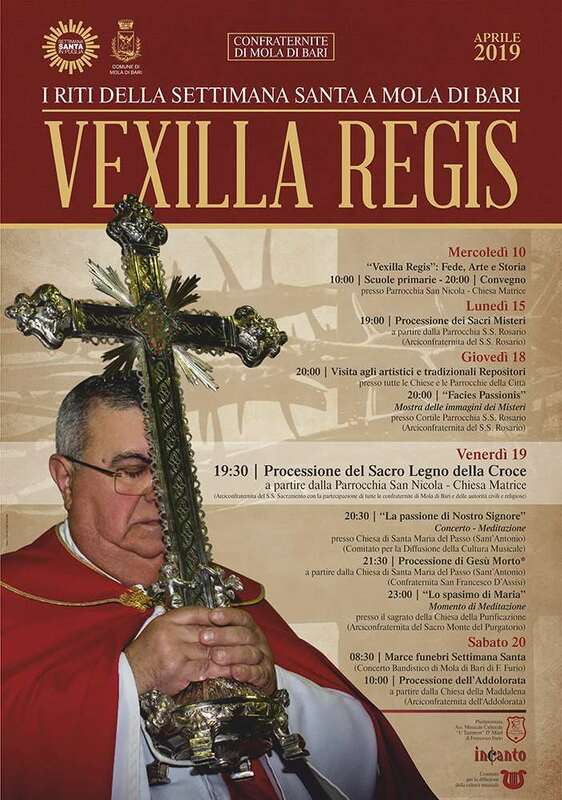 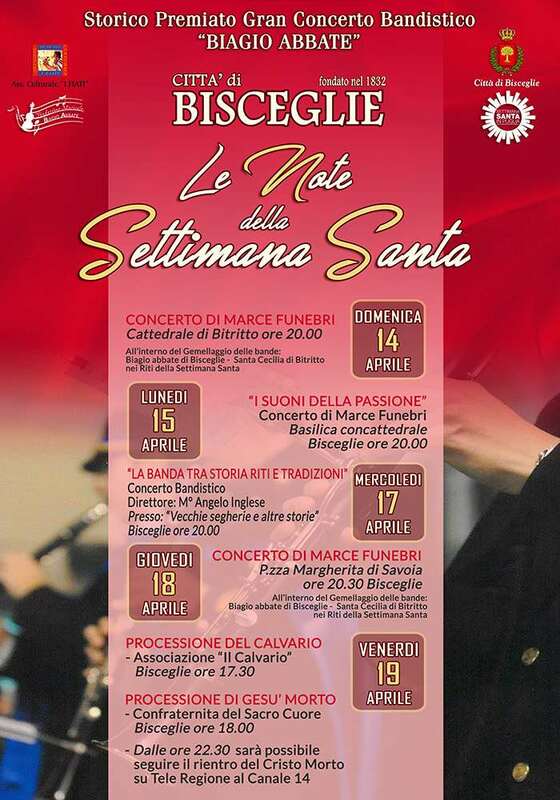 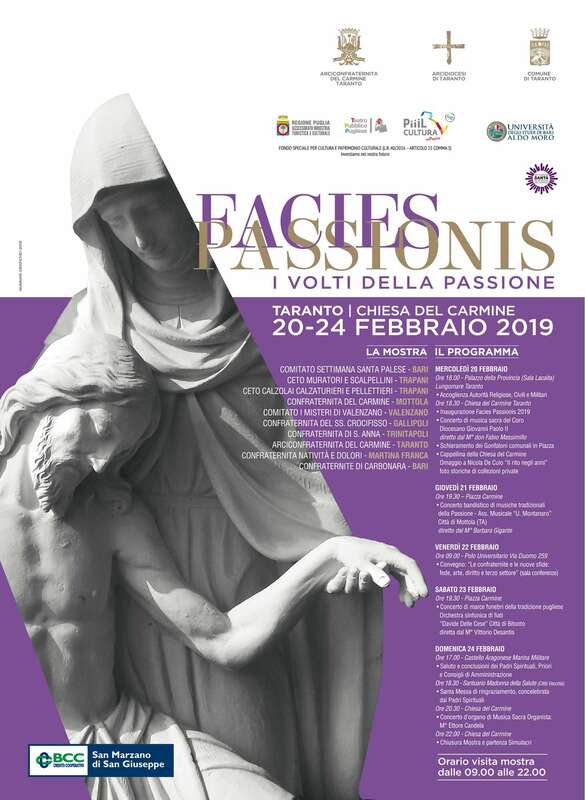 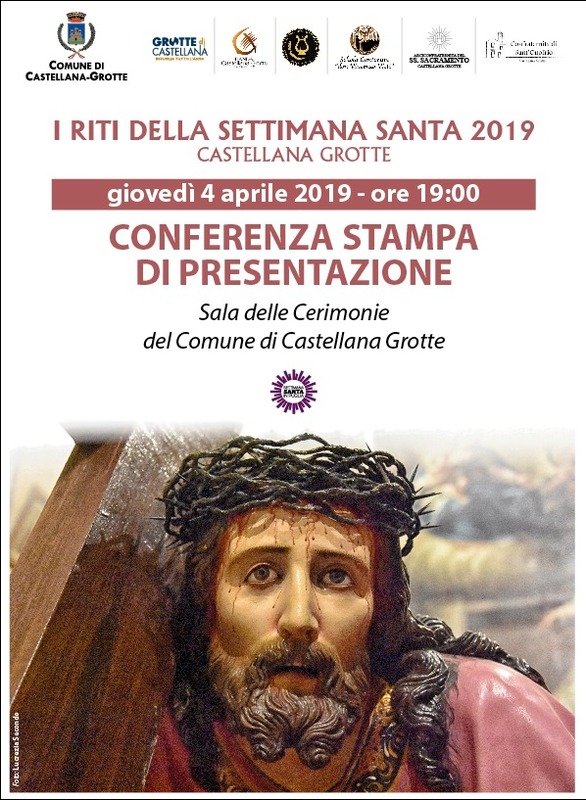 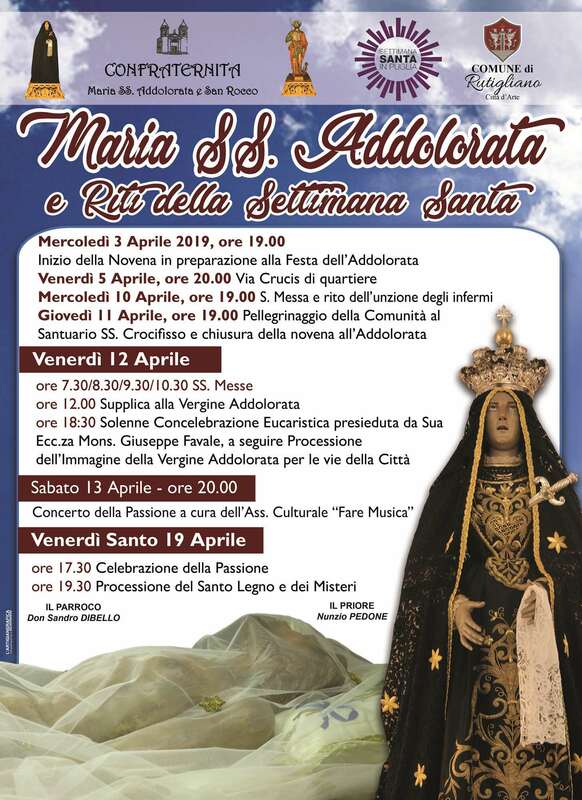 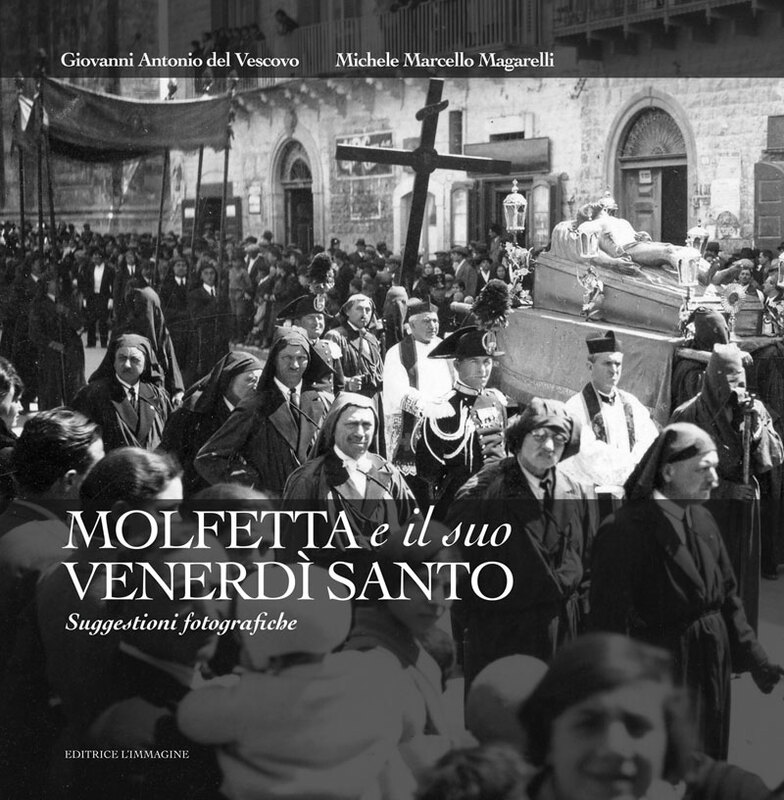 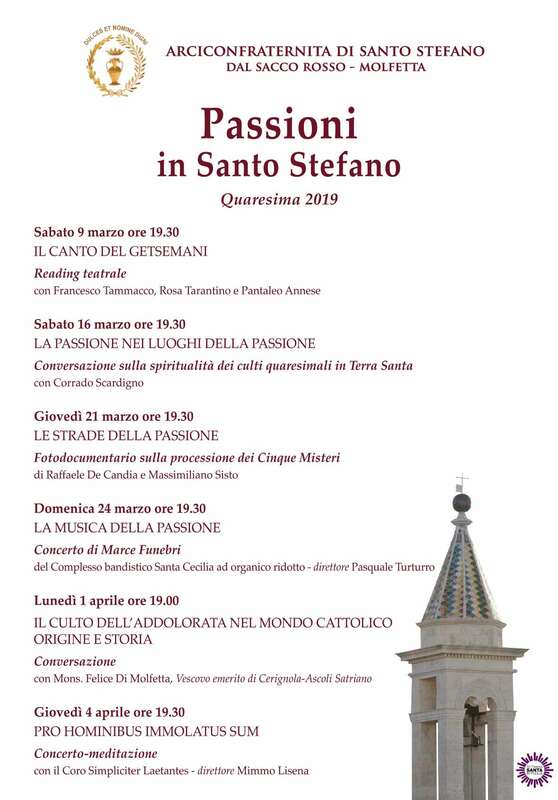 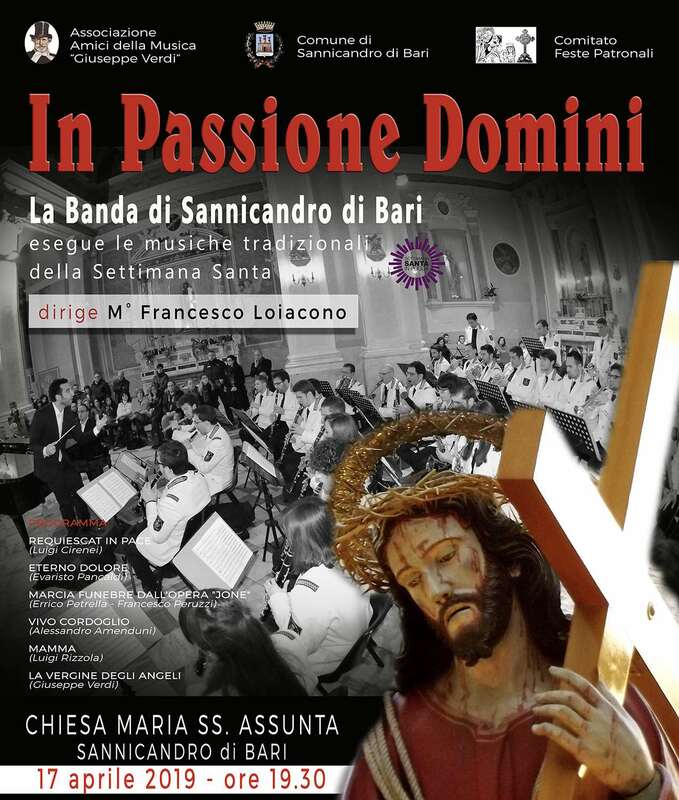 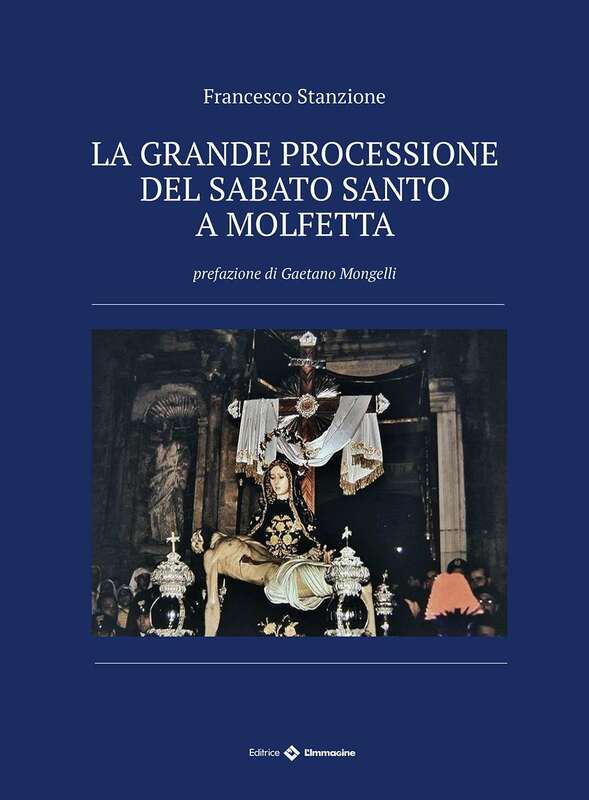 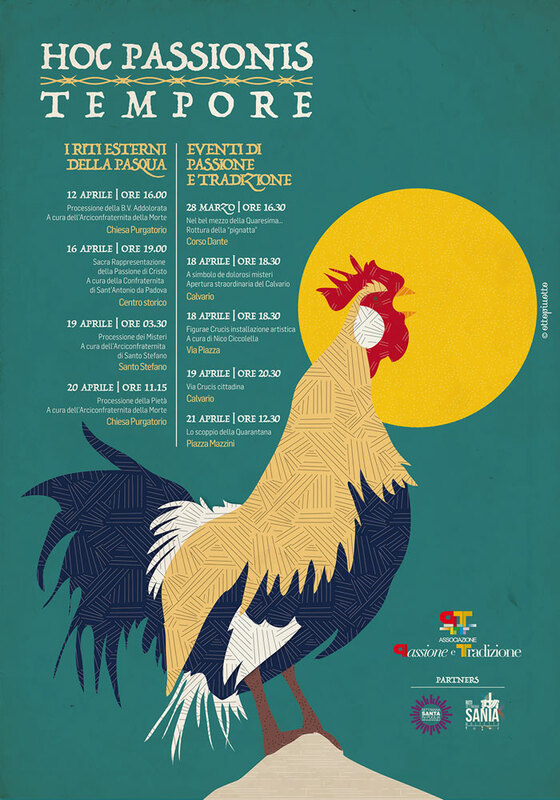 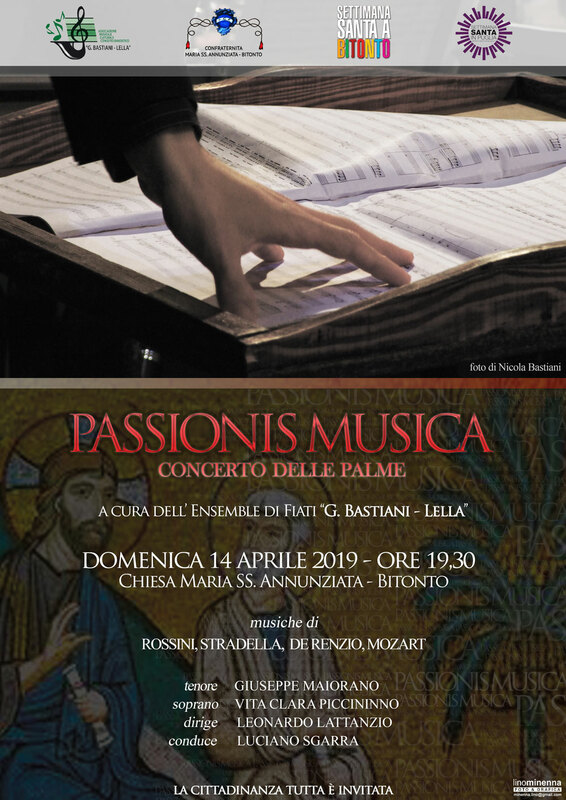 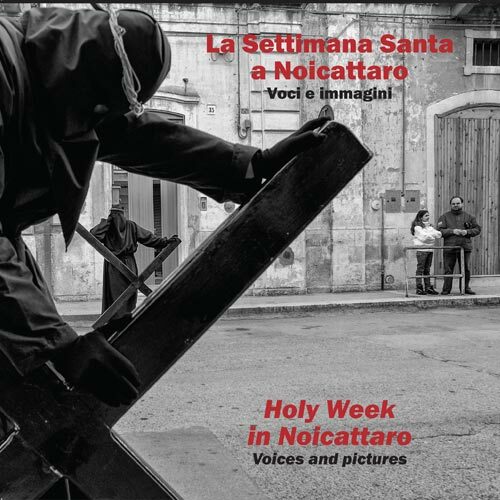 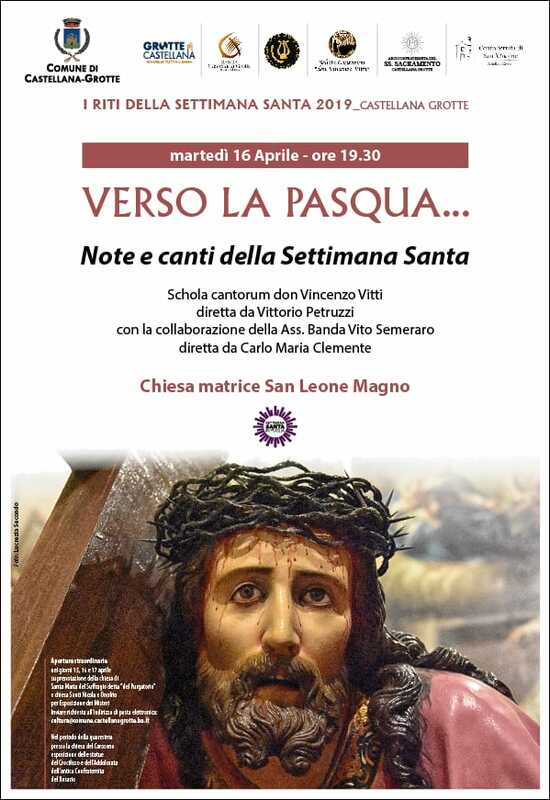 • MOLFETTA / Procession of Cross / Church of Purgatorio / h 0.01 a.m.
• ANDRIA / Procession of Sacra Spina / Cathedral / h 6.00 p.m.
• GROTTAGLIE / The Living Passion / Historic centre / h 6.00 p.m.
• BITONTO / Procession of Addolorata / Cathedral / h 9.30 a.m.
• GALLIPOLI / Friday of Most Blessed Virgin Lady of Our Sorrows / Church Santa Maria del Carmelo / h 12.00 p.m.
• MOLFETTA / Procession of Addolorata / Church of Purgatorio / h 3.15 p.m.
• RUVO DI PUGLIA / Procession of the Desolata / Church of S. Domenico / h 5.00 p.m.
• CANOSA DI PUGLIA / Procession of Addolorata / Church of San Sabino / h 5.30 p.m.
• GROTTAGLIE / Procession of the Desolata / Mother Church / h 6.30 p.m.
• ANDRIA / Procession of Confraternale Our Lady of Sorrows / Church of S. Francesco d’Assisi / h 7.00 p.m.
• CONVERSANO / Via Crucis / Throughout the old town / h 7.00 p.m.
• FRANCAVILLA FONTANA / Procession ''Ad tenebras'' / Church Santa Chiara / h 7.00 p.m.
• VALENZANO / Interparochial Via Crucis with image of Our Lady of Sorrows / Throughout the town / h 7.30 p.m.
• SAN MARCO IN LAMIS / The Layiing ang lighting of the ''Fanoja'' / Church of Lady of Our Sorrow / h 8.00 p.m.
• GROTTAGLIE / The Living Passion / Historic centre / h 7.00 p.m.
• GINOSA / The Living Passion ''Passio Christi'' / Old Town / h 7.30 p.m.
• FRANCAVILLA FONTANA / Procession of Cross / Throughout the town / h 9.00 a.m.
• TROIA / The Living Passion / Church of Lady of Mediatrice. 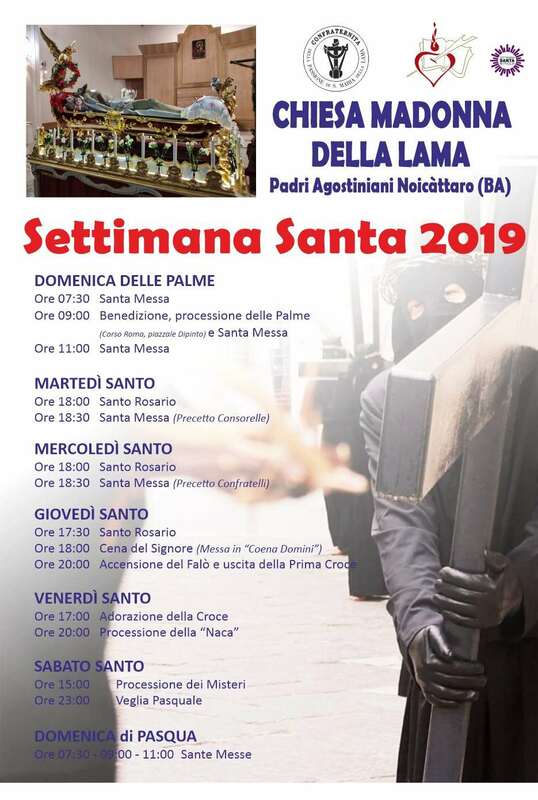 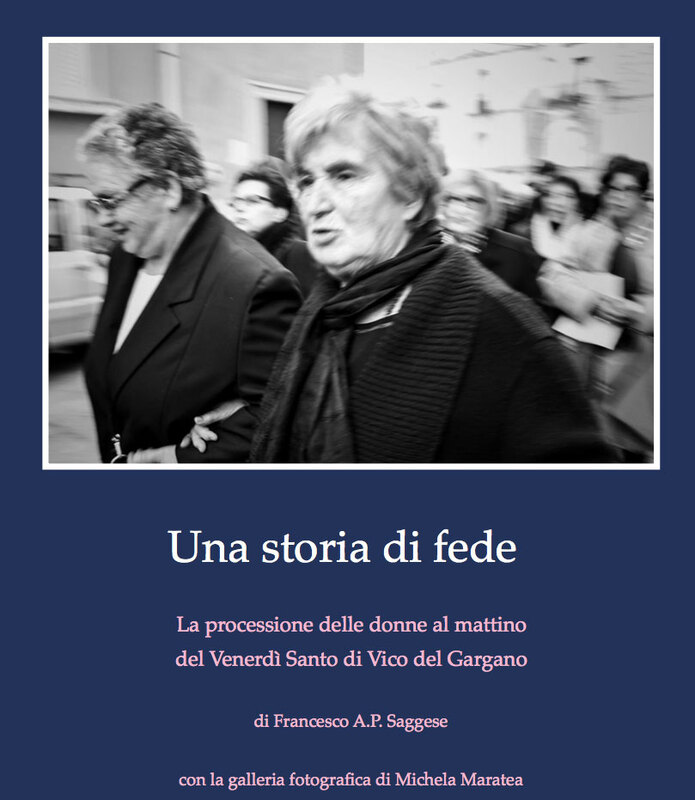 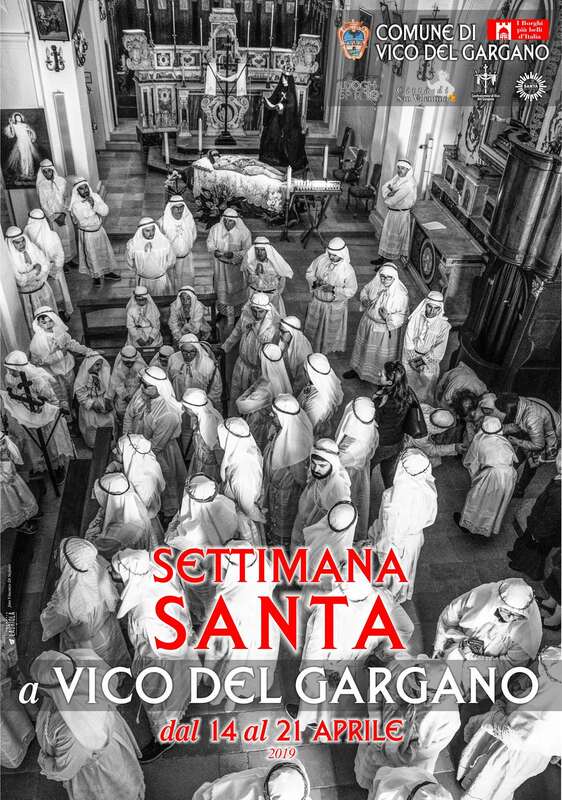 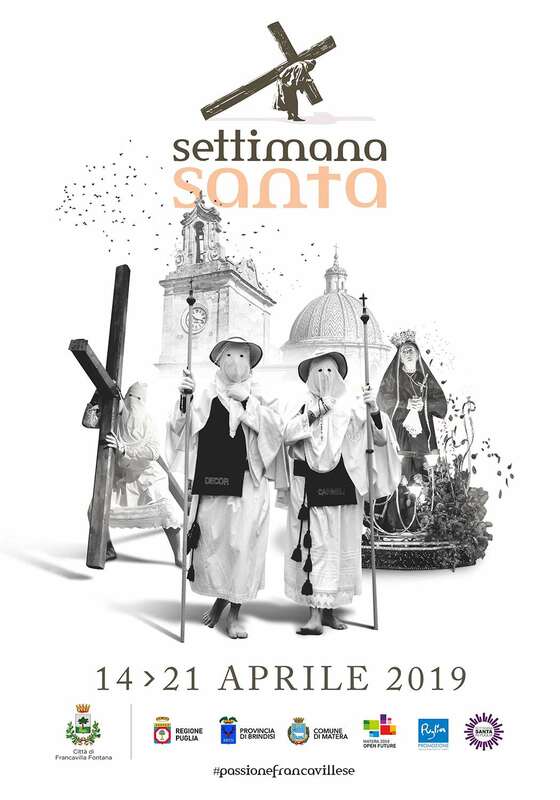 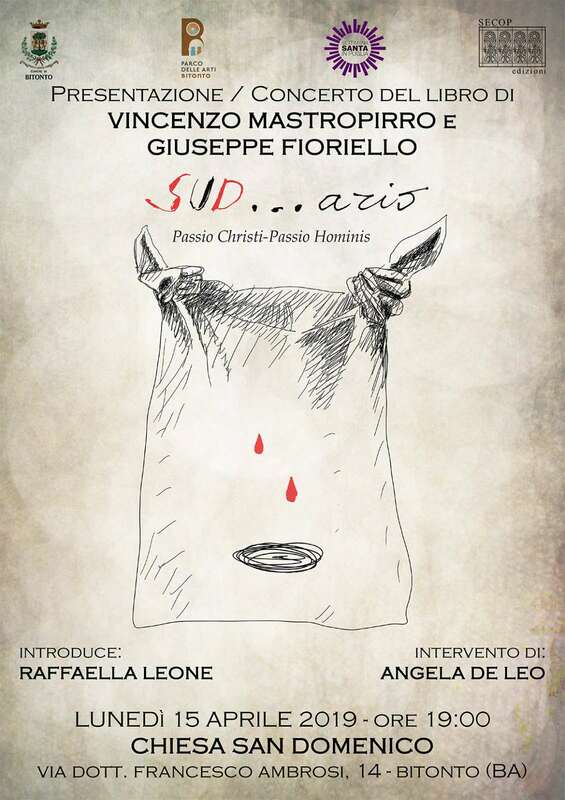 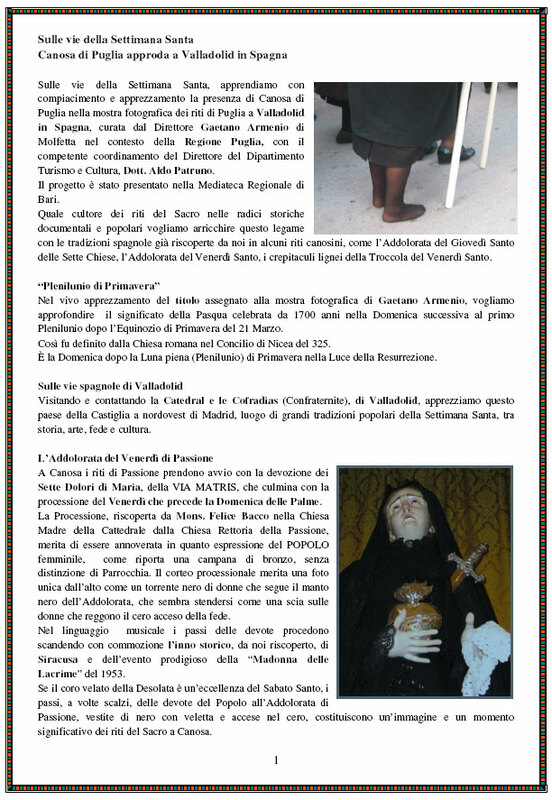 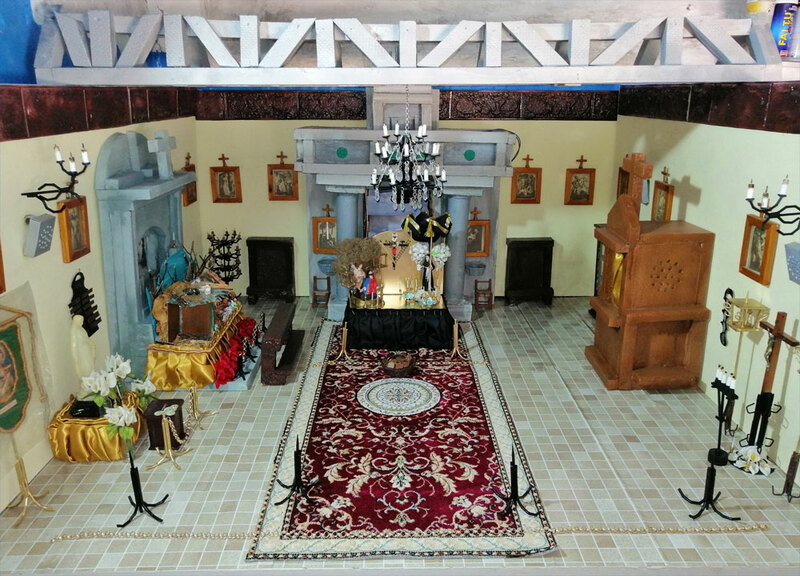 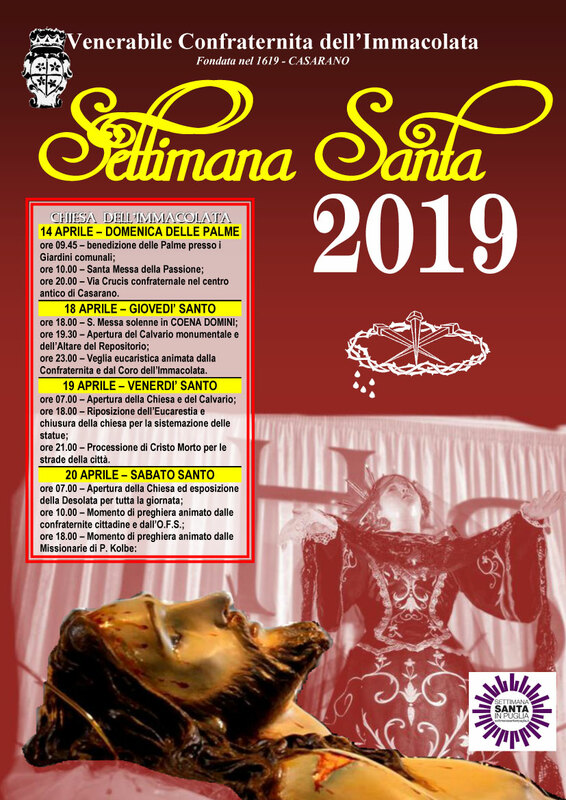 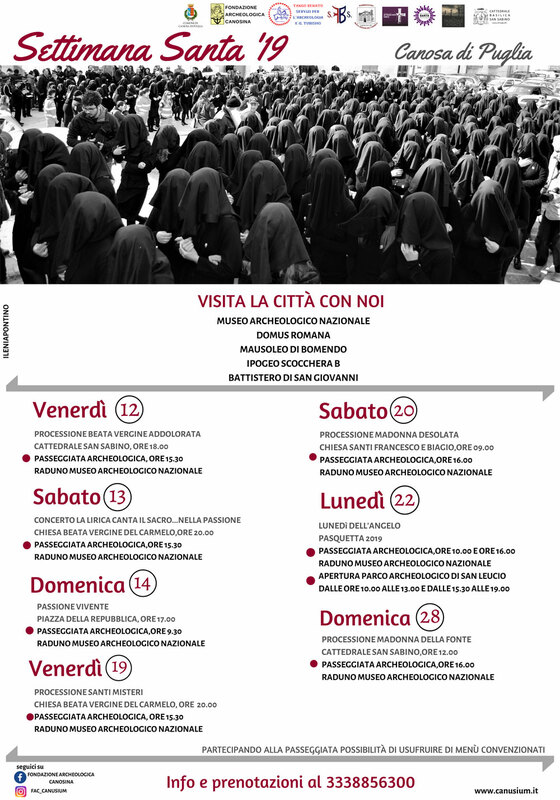 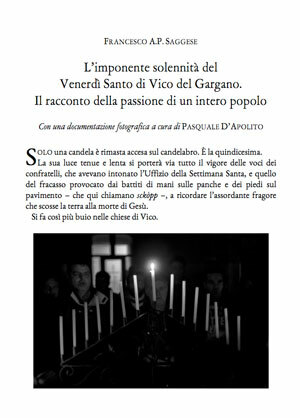 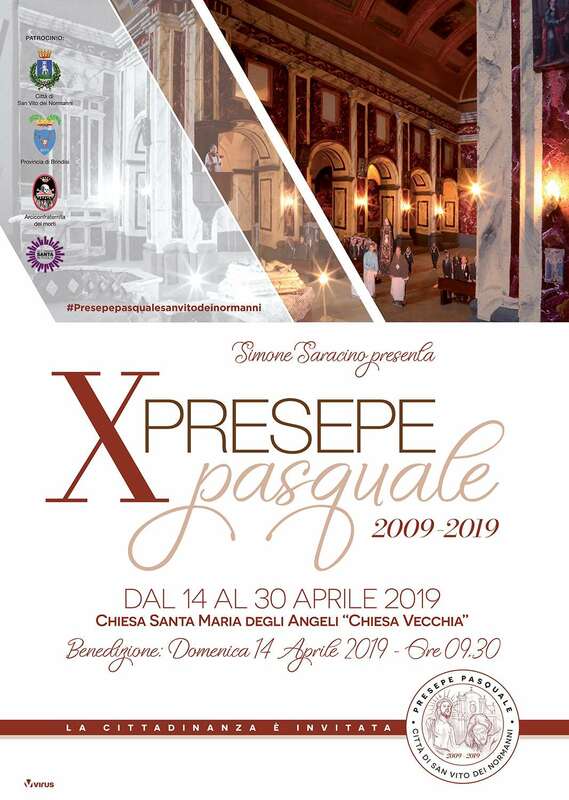 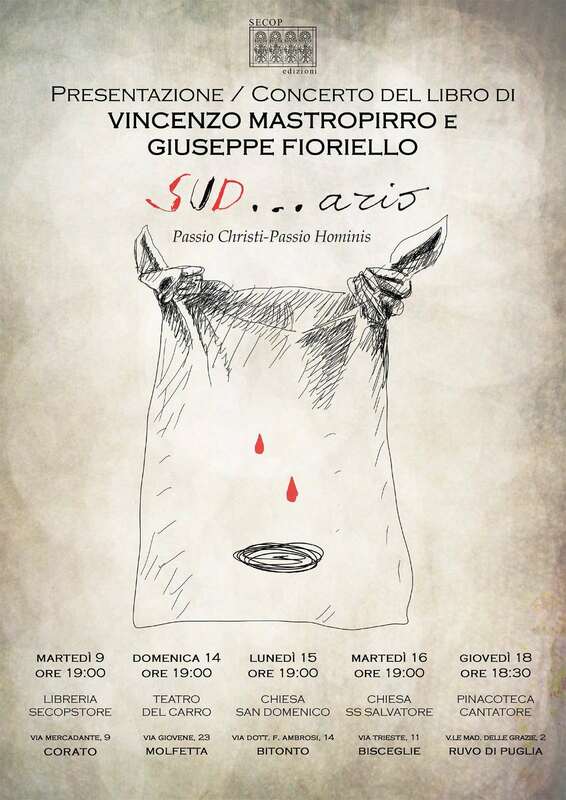 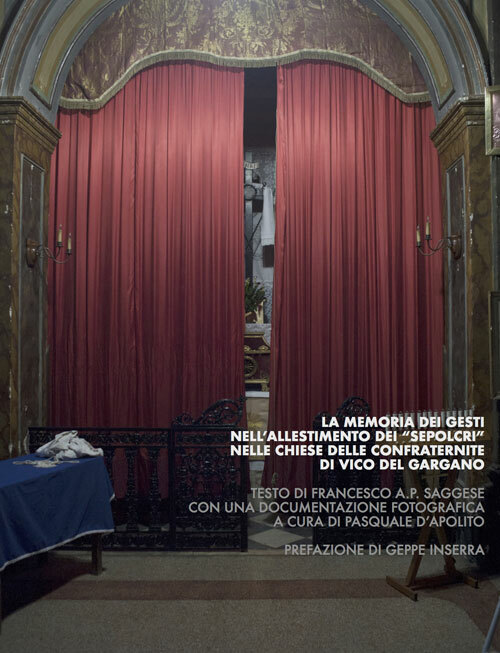 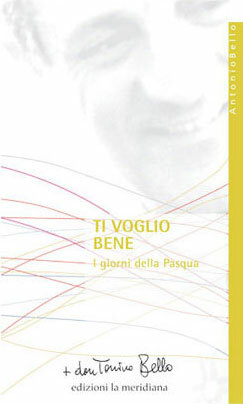 Through the streets of the town / h 3.00 p.m.
• RUVO DI PUGLIA / Procession of the Deposition, or of the "Eight Saints" / Church of San Rocco / h 2.00 a.m.
• MONTE SANT'ANGELO / The Grain of the Sepulchre / Church of San Benedetto / h 5.00 p.m.
• PULSANO / Pilgrimage of “Perduni” / Church of Purgatorio / h 5.00 p.m.
• VICO DEL GARGANO / Holy Mass "In Coena Domini" / All churches / h 5.00 p.m.
• FRANCAVILLA FONTANA / Pilgrimage of the ''Pappamusci'' / Throughout the town / h 6.00 p.m.
• GROTTAGLIE / Celebration of the Eucharist with the preparation of the "Sepolcrum domini" by the brother of confraternity of Carmine (Bbubbli Bbubbli) / Oratorio of Carmine / h 6.30 p.m.
• GALLIPOLI / The Confraternities in processional attire visit the Altars of Repose prepared throughout the old town / Old Town / h 7.30 p.m.
• NOICATTARO / Bonfire / Church of Madonna della Lama / h 7.30 p.m.
• CONVERSANO / Bonfire of the Addolorata / Calvario / h 8.00 p.m.
• NOICATTARO / Procession of first Crossbearer / Church of Madonna della Lama / h 8.00 p.m.
• VICO DEL GARGANO / Tenebrae Service Sung by the voices of the Confraternity with final “schopp” / Church of Saint Nicholas, Church of Saint Joseph, Church of Mercy, Church of Carmine, Church of Purgatory / h 8.30 p.m.
• BITONTO / Funeral marches concert / Throughout the town / h 11.30 p.m.
• TARANTO / Procession of Addolorata / Church of S. Domenico Maggiore / h 0.01 a.m.
• CONVERSANO / Procession of the Black Christ / Church Santa Maria dell'Isola / h 3.00 a.m.
• MOLFETTA / Procession of Five Mysteries / Church di S. Stefano / h 3.30 a.m.
• BITONTO / Procession of Mysteries / Church of S. Domenico / h 4.30 a.m.
• CORATO / Procession of our Lady of Sorrows / Church of San Giuseppe / h 4.50 a.m.
• SAN MARCO IN LAMIS / Procession of Our Lady of Sorrows with Stabat Mater / Church of Lady of Our Sorrow / h 5.30 a.m.
• VALENZANO / Gathering of the Holy Mysteries / Corso A. Moro / h 8.00 a.m.
• VICO DEL GARGANO / Morning Procession of Penance / All churches / h 8.00 a.m.
• GALLIPOLI / The Confraternities in processional attire visit the Altars of Repose prepared throughout the old town / Old Town / h 9.00 a.m.
• BISCEGLIE / Procession of "meeting" / Piazza Vittorio Emanuele / h 9.30 a.m.
• TROIA / Procession of the “Chains” / Church of Sant’Anna / h 10.00 a.m.
• CONVERSANO / Procession of Addolorata / Church of Carmine / h 10.30 a.m.
• VALENZANO / Procession of Mysteries / Corso A. Moro / h 10.30 a.m.
• VALENZANO / The parish priest places the cross in the hands of Mary, Our Lady of Sorrows / Church of San Rocco / h 3.00 p.m.
• VICO DEL GARGANO / The “Messa Pazza”, or “Wild Mass” and the Agony of Christ in the afternoon / Church of Purgatorio / h 3.00 p.m.
• CONVERSANO / The Procession of the Mysteries and the ''Sacro Legno'' / Church of the Passion / h 4.00 p.m.
• PULSANO / Procession of Mysteries / Church of Purgatorio / h 4.00 p.m.
• MONTE SANT'ANGELO / The procession of the dead Christ / Church of San Francesco / h 5.00 p.m.
• SAN MARCO IN LAMIS / Procession of Addolorata / Church of S. Antonio Abate / h 5.00 p.m.
• TARANTO / Procession of Mysteries / Church of Carmine / h 5.00 p.m.
• RUVO DI PUGLIA / Procession of Mysteries / Church of Carmine / h 5.30 p.m.
• BISCEGLIE / Procession of Mysteries / Church of Purgatorio / h 6.00 p.m.
• BITONTO / Procession of “Gala” of Holy Friday / Church of Purgatorio / h 6.00 p.m.
• CORATO / Procession of the Mysteries / Church of San Giuseppe / h 6.00 p.m.
• GALATINA / Holy Friday / Church of Addolorata / h 6.00 p.m.
• GALLIPOLI / The Procession of the Mysteries and the Dead Christ / Confraternal Oratory del SS. 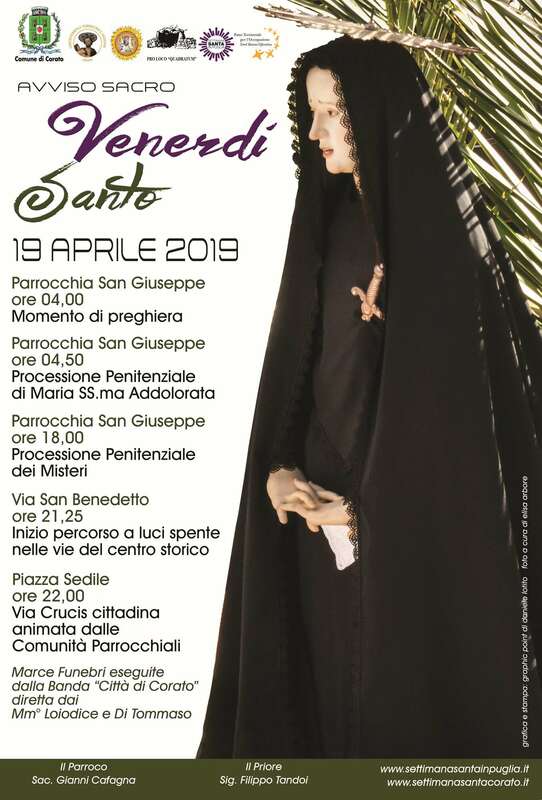 Crocifisso / h 6.00 p.m.
• GROTTAGLIE / Procession of Mysteries / Mother Church / h 6.00 p.m.
• VICO DEL GARGANO / Evening Solemn Procession / Mother Church / h 6.00 p.m.
• ANDRIA / Procession of Mysteries / Church of Purgatorio / h 7.00 p.m.
• FRANCAVILLA FONTANA / Procession of Mysteries / Throughout the town / h 7.00 p.m.
• CANOSA DI PUGLIA / Procession of Mysteries / Church of Carmine / h 7.30 p.m.
• CASTELLANA GROTTE / Holy Friday / Mother Church S. Leone Magno / h 8.00 p.m.
• NOICATTARO / Procession of “Naka” / Church of Madonna della Lama / h 8.00 p.m.
• SAN MARCO IN LAMIS / Procession of Addolorata with fracchie lighting / Church of Lady of Our Sorrow / h 8.00 p.m.
• TROIA / Procession of Mysteries / Cathedral / h 8.00 p.m.
• ALBEROBELLO / The Living Passion / Piazzale Indipendenza / h 9.00 p.m.
• NOICATTARO / Procession of Addolorata / Church of Santa Maria della Pace / h 2.00 a.m.
• GALLIPOLI / Procession of the Desolata / Church della Purità / h 2.30 a.m.
• GALATINA / Holy Saturday / Church of Addolorata / h 5.30 a.m.
• BOTRUGNO / Procession of Holy Saturday with statues of Jesus and the Dead Lady of Sorrows / Church of the Assunta / h 6.00 a.m.
• CASTELLANA GROTTE / Holy Saturday / Church of Sant’Onofrio / h 7.00 a.m.
• CORATO / Procession of the Pietà / Church of Santa Maria Greca / h 7.50 a.m.
• CANOSA DI PUGLIA / Procession of the Desolata / Church of Saints Francesco and Biagio / h 9.00 a.m.
• SAN MARCO IN LAMIS / The Living Passion / Throughout the town / h 10.00 a.m.
• MOLFETTA / Procession of “Pietà” Group / Church of Purgatorio / h 11.15 a.m.
• NOICATTARO / Procession of Mysteries / Church of Santa Maria della Pace / h 3.00 p.m.
• RUVO DI PUGLIA / Procession of “Pietà” / Church of Purgatorio / h 4.30 p.m.
• GINOSA / Passio Christi / Old Town / h 7.30 p.m.
• RUVO DI PUGLIA / Procession of Resorted Chriist and the burst of "Quarantane" / Church of S. Domenico / h 9.30 a.m.
• TROIA / Procession of the Kiss / Church of Saint Dominic and Church of Saint Francis / h 10.00 a.m.
• GALLIPOLI / The bursting of the "Caremma" / Old Town / h 12.00 p.m.
• SAN MARCO IN LAMIS / Procession of Addoloratadressed in festive garb / Church of Lady of Our Sorrow / h 12.01 p.m.
• FRANCAVILLA FONTANA / Procession of Resorted Christ / Church Immacolata / h 6.00 p.m.